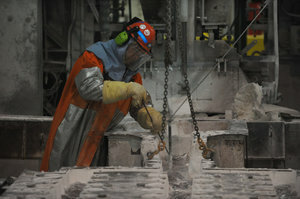 Alcoa Intalco Works will get the low-cost electric power it needs through May 26, 2012, under the terms of a Bonneville Power Administration contract extension announced in final form Friday, Oct. 29. BPA had announced its plans to extend the contract three weeks ago, but the decision was not final until after a public comment period. BPA spokeswoman Katie Pruder-Scruggs said nothing in those comments forced a reconsideration of BPA's determination that selling low-cost power for the aluminum smelter west of Ferndale results in an economic benefit. Intalco workers have been living with job insecurity for years as Alcoa, BPA and other power users wrangled over how much cheap hydroelectric power should be allotted to the smelter, and under what terms. The company's use of 320 megawatts of power is roughly equivalent to one-fourth the power consumption of the city of Seattle. Some public utility district officials argue that BPA should reserve its limited supply of cheap Columbia River hydropower for them. But BPA Administrator Steve Wright has argued that the Intalco smelter is a net economic benefit to the region, creating an estimated 1,500 indirect jobs in addition to the direct payroll of about 500. BPA is also in the process of trying to work out a longer-term deal with Intalco that would make smelter operations more of a long-term proposition.